Serve with a big scoop of vanilla ice cream! In a small bowl, combine the flour, oats and brown sugar; stir in butter. Set aside half for topping. Press remaining crumb mixture into an ungreased 8-inch square baking dish. Arrange rhubarb over crust. In a saucepan, combine the sugar, cornstarch and water until smooth. Bring to a boil. Cook and stir for 2 minutes or until thickened and bubbly. Stir in vanilla. Pour over the rhubarb. Sprinkle with reserved crumb mixture. 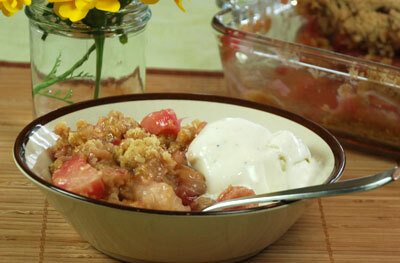 Bake at 350 degrees F. for 45 to 50 minutes or until topping is golden brown and rhubarb is tender.